Leonora Carrington Exhibition and Symposium in Mexico City – Zero Equals Two! WOWSERS! A Leon0ra Carrington symposium and “Magical Tales” exhibition is being held at the Museo de Arte Moderno in Mexico City! Pop her name into this blog’s search engine and you’ll find a buncha postings on her as we love her painting, her writing and her wizarding! The symposium takes place Thursday August 30 from 10 a.m. to 3 p.m. and speakers include Robert Ansell of Fulgur Ltd Publishing. “In recent years, interest in the academic world has resurfaced due to the impact of occult arts in modern art, cinema and literature. Perhaps surrealism is the vanguard that was most deeply marked by esotericism and magic. 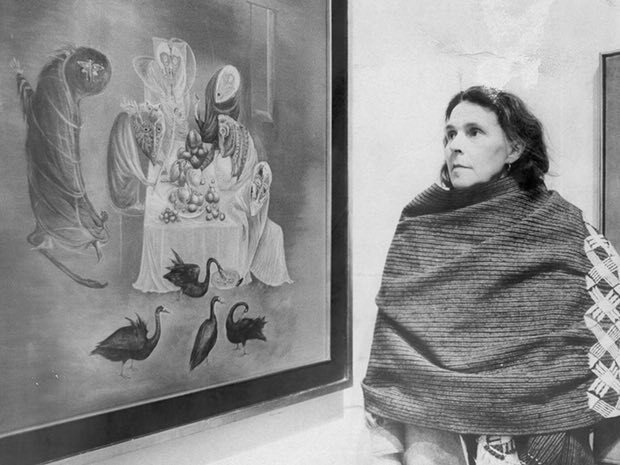 Among its exponents Leonora Carrington stands out, due to its unique approach to motives and esoteric thinking. This symposium focuses on Carrington’s broad interests in the occult, from its idiosyncratic fusion of different traditions, to the use of esotericism and spiritualism as means to imagine new ecologies. In this way, Carrington’s art will be embraced from a broader context, which includes the esoteric concerns of his close collaborators, such as Remedios Varo and Alejandro Jodorowsky. I understand that there is an exhibit of works by Leonora Carrington and Romedios Varos at the Museum. If this is correct, please advise me when this exhibit will be closed as I would like to schedule a trip to Mexico City. I believe that’s all posted on the Museum’s website. I hope you manage to visit the exhibit!